Aly The Red's Shop (Bliss Monkey Studio) on Etsy is sponsoring this Giveaway! 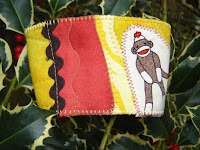 She is giving One lucky WINNER this AdOrAbLe Coffee Cuff!!!! 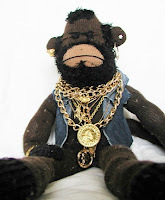 "Hey Banana Breath" is a favorite of sock and plush monkey fans. It features the monkey (each one will be slightly different from photo but same idea), three fabrics, rick rack, velvet ribbon and all my quilting extras. It will keep your hands comfortable, while gripping a hot or cold beverage. Store it in your desk or bag, or clip to your key chain till you arrive at the coffee/tea shop, then whip that puppy on your paper cup and enjoy! Never use a cardboard cuff again!" the latest in style-rocking accessories!" 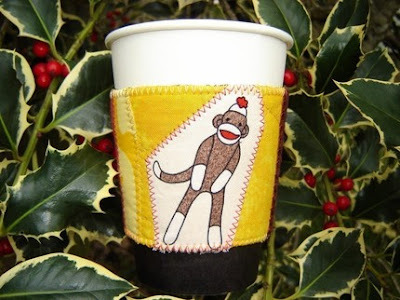 Aly sent me the giveaway item "Banana Breath" Coffee cuff! It is soooo soft and is a beautiful piece of quilt art! I am a sucker for a cute sock monkey (have you ever seen an ugly one?) Her BIO on Etsy said "One thing people don't know is that I'm also a passionate art quilter (small art that happens to be made of textile rather than something like paint)." I love companies who support Charity. 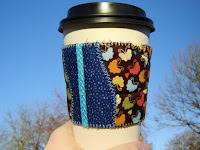 Her proceeds from "Flying Hearts" coffee cozies go to women diagnosed with breast cancer, specifically for alternative therapies not covered by insurance. Hi, What a delightful site! I also adore her set of 2 "You are Invited"
I put Aly the Red on my list of Etsy favorites. Thanks for the fun prize giveaway drawing. Also, I subscribed to Aly the Red on Etsy with my Yahoo Reader. "I read the Dolce Gusto review"
I entered the Almond Coffee Giveaway. Thanks. Thanks for playing and Thanks to Aly The Red for donating the coffee cuff! I'm off to Random.org pick the winner!!! #7 WindyCindy won! Congrats to all who entered!